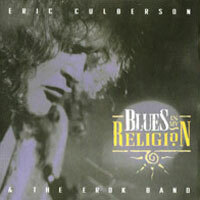 Blues Is My Religion is Eric Culberson’s debut studio release, following his recently being signed by Kingsnake Records as a solo artist. The title track reached #24 in the national Blues Airplay Chart, and was used in the pilot episode of the TV show “Savannah”, an Aaron Spelling and Warner Brothers production shown nationwide. Music Choice Network, a twenty-four hour commercial-free digital music service available through cable TV and direct TV satellite to millions of subscribers, chose eight tracks from Blues is my Religion for regular rotation.